We will be closed on Easter Sunday! Wishing you a Happy Easter with your family & friends! Your dog evolved as a meat eater. The structure of his teeth, jaws and digestive system scientifically classifies him as a carnivore, evolved for a meat-based diet. 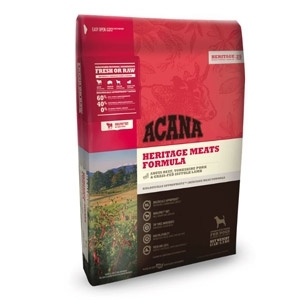 That’s why we loaded ACANA Heritage Meats with Angus beef, Yorkshire pork and grass-fed lamb — all raised on local Kentucky farms and delivered fresh, in WholePrey™ ratios of meat, liver, tripe, kidney and cartilage to nourish your dog completely.